Edward Plunkett Taylor had been a fixture in Canadian racing for decades when he bought a yearling filly named Natalma for $35,000 specifically to breed to his champion Canadian-bred stallion, Nearctic. Natalma was by champion Native Dancer and out of the great mare Almahmoud, by Mahmoud. The Virginia-bred filly won the Spinaway Stakes for Taylor, but was disqualified to third, then chipped a knee while training for the Kentucky Oaks and had to be retired. She was sent immediately to Taylor's Windfields Farm in Ontario to be bred to Nearctic, a son of the great Italian stallion Nearco out of an Irish-bred mare named Lady Angela, by Hyperion. This decision would change Thoroughbred racing forever. Natalma’s first foal, born May 27, 1961, was a feisty little bay colt with a crooked blaze and three socks. It soon became apparent that he wanted everything done his way, but Taylor's wife Winnie was captivated by him. A year later, the pony-sized yearling at Taylor’s Windfields Farm regularly dumped his exercise riders and wasn't above taking a nip out of people. It wasn't that he was mean. He just wanted everyone to know that, despite his physical size, he was the Big Horse! When Taylor held his annual yearling sale, he set a $25,000 reserve on the chunky little colt. There were no takers. Taylor decided to race him, and Winnie named the colt Northern Dancer. The name could not have been better chosen. The pint-sized colt that no one else wanted would soon be dancing right into the winner's circle. Canadian jockey Ron Turcotte, who rode Secretariat to his Triple Crown win, actually got his start as a hot walker at Windfields Farm. He rode Northern Dancer to his first victory at two at Fort Erie Racetrack. After that, Northern Dancer went on to win stakes at Woodbine in Toronto and Aqueduct in New York, and was named Canadian Juvenile Champion Colt for 1963. Being towered over by his opponents just seemed to make the colt run faster. Taylor began thinking he might have a Derby horse. In the spring of 1964, the Dancer won the Flamingo Stakes, defeating Mr. Brick and Quadrangle, and beat The Scoundrel in the Florida Derby. Despite his success with Northern Dancer, regular rider Bill Shoemaker made a fateful decision to jump ship before the Blue Grass Stakes and chose the unbeaten Hill Rise as his Derby mount. Bill Hartack then became the Dancer's new rider and promptly won the Blue Grass, defeating Allen Adair by a length. Still people didn’t believe he was the real deal. Being a late foal, Northern Dancer was several months younger than many of his opponents and still barely bigger than a pony. As well, he was born in Canada, not known as a big producer of race horses at that time. How could anyone believe that such a horse could win the Kentucky Derby? Taylor was undeterred. He knew his little horse had determination and courage, and his breeding was excellent. His sire was Horse of the Year in Canada. His grandsires were both champion runners and sires. The genetics all said the little guy could run, and anyone taking a closer look would see the Dancer's bulging muscles, the incredibly deep chest, the neat little ears harkening back to his Arabian ancestors, and that indefinable something as Northern Dancer stared out into the distance with his large, intelligent eyes. Horsemen call it the Look of Eagles. On Derby Day, with Bill Hartack up, the Dancer was on his toes. When the gate opened, he was ready. After running easily with the pack, as the horses entered the home stretch, Northern Dancer poked his white nose in front. The socks on his short legs were flashing as he seemed to skip across the ground. “And there goes Northern Dancer!” shouted track announcer Chic Anderson as the little colt flew into the lead. Hill Rise closed to within a neck but, despite his considerable size advantage, he could not get by. The Canadian colt hit the wire in front to win the Run For the Roses in track record time of two minutes flat. As of 2012, only Secretariat (1973) and Monarchos (2001) have beaten Northern Dancer's record time. Hill Rise could only manage second, with The Scoundrel finishing in third spot. The future 1965 Horse of the Year, a gelding named Roman Brother, was fourth, followed by Quadrangle and Mr. Brick. This would prove to be one of the best Derby fields of the decade. Hill Rise raced successfully at four and five, winning several major stakes races in America and England and was named Champion Miler in England in 1966. The Scoundrel would later be sold for half a million dollars and was sent to stud in France at age 11. He sired Canadian champion mare Belle Geste. Mr. Brick sired a few good horses in his very short stud career before his untimely death in 1968, and his name still shows up in pedigrees today. The best sire among the beaten horses in Northern Dancer's Derby was Quadrangle. He was stakes placed at four, and went on to sire horses like Angle Light (who defeated Secretariat in the Wood Memorial), multiple stakes winner Quadratic, champion filly Smart Angle, the great Canadian broodmare and champion Square Angel and millionaire and multi-champion Susan's Girl. 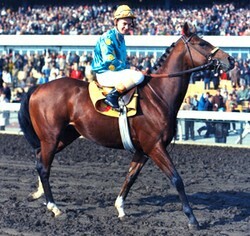 Northern Dancer won the Preakness easily, again defeating The Scoundrel, Hill Rise and Quadrangle. People who once thought he could not possibly win the Kentucky Derby began to talk about him winning the Triple Crown. But in the 1-1/2 mile Belmont, Hartack tried to rate him and wrenched the colt’s head right into his chest. The Dancer fought him all down the back stretch, using up valuable energy early in the race. By the time Hartack called on him, he had only enough left to finish a game third behind Quadrangle and Roman Brother. He also came out of the race with a sore tendon. To this day, there are people who say Northern Dancer lost the Triple Crown only because of the dreadful ride by Hartack. In his next start, despite his injury, the Dancer was an easy winner in Canada's major classic race, the Queen’s Plate, over Langcrest and Grand Garcon, but the race took its toll on his bad leg. Although he was kept in training until August, the bowed tendon did not respond to treatment. His racing career was over. He was retired after winning 14 of 18 races, never finishing worse than third. He earned more than $580,000, a huge amount at the time. But Northern Dancer’s greatest exploits were still to come. In his first crop of just 21 foals, he sired 10 stakes winners, including champion Viceregal. After standing at stud at Windfields in Ontario, he went to the Maryland division of Taylor's breeding enterprise, where he would remain for the rest of his life. Year after year, the stakes winners and champions kept coming. At the height of his fame, he commanded a stud fee of a whopping $1-million per mare. In 1984, the twelve Northern Dancer yearlings that were sold at auction averaged nearly $3.5-million. Many of his sons and daughters became champion sires and producers themselves, generation after generation, right up to the present day. By the time he died of colic in November 1990 at age 29, it was not uncommon for many of the horses entered in the Kentucky Derby to have Northern Dancer somewhere in the pedigree. After his death, with special permission from the Canadian government, Northern Dancer's body was brought back to Canada, and he was buried at Windfields Farm in Oshawa. Although Windfields ceased operations in 2009, the horse cemetery where Northern Dancer is buried is undisturbed. A statue of Canada's “big little horse” stands at Woodbine Racetrack north of Toronto. As a stallion, Northern Dancer's influence has been felt in many countries. He was leading sire in the USA in 1971 and 1977 and leading sire in Great Britain four times. Although known as a sire of sires, his daughters were every bit as good, making him Leading Broodmare Sire in 1991. Among his greatest offspring were English Triple Crown winner Nijinsky, Epsom Derby winners The Minstrel and Secreto, plus Sadler's Wells, Storm Bird, Danzig, Dixieland Band, El Gran Senor, the filly Fanfreluche, Lyphard, leading steeplechase sire Northern Baby, Northern Taste (eleven times leading sire in Japan), Nureyev, Sovereign Dancer (sire in France) and Vice Regent. His stud record of 147 stakes winners included 26 champions in Canada, the USA, Great Britain, France and Italy. This record stood for many years until finally broken by his sons. Northern Dancer's sire line has continued as strong as ever through stallions such as Giant's Causeway, Awesome Again, Deputy Minister, El Prado, Kitten's Joy, Medaglia d'Oro (sire of Rachel Alexandra), Ghostzapper, Belong To Me, Hennessy, Forestry, D'Wildcat, Freud, Danehill, Horse Chestnut (South Africa), Langfuhr, Lemon Drop Kid, Silver Deputy, Theatrical, Singspiel (Ireland), Sky Classic, Storm Cat, Touch Gold, Rock of Gibralter (European Horse of the Year) and hundreds more around the world. When Mine That Bird, a little bay horse that nobody thought had a chance, came up the inside to win the 2009 Kentucky Derby, it was 45 years to the day since another little bay horse named Northern Dancer recorded his greatest victory. Like so many other recent Derby winners, Mine That Bird is descended from Northern Dancer. In the last 20 years (1993 to 2012), thirteen winners have had Northern Dancer in their pedigrees, and three of those have been direct male descendants: Big Brown (2008), Charismatic (1999) and Sea Hero 1993). In 2013, all but two of the twenty Derby entries had Northern Dancer in their pedigrees, and eleven of the twenty are direct tail-male descendants. As for Bill Shoemaker, who chose to ride Hill Rise instead of Northern Dancer in 1964, he made the right choice when given the chance to ride a Northern Dancer grandson named Ferdinand in the 1986 Kentucky Derby. This time, he won. Want to learn more? There have been many books written about Northern Dancer and about his breeder and owner, E.P Taylor. These are some of my favourites. There is a great book specifically about E.P Taylor that is out of print, but it is available from the author, Muriel Lennox. I followed Northern Dancer's history when I was a kid living in Toronto and in love with horses. You have brought back great and warm memories.